This simple recipe has been served in my family for at least two generations, well actually three - counting myself. As the title of this recipe suggests, there are two parts to it: amaretti and flan. Amaretti are basically a form of almond macaroon, from the Italian "maccaróne" or "maccheróne". According to the Vocabolario Etimologico della Lingua Italiana, the latter traces back to an old Greek word for "to crush" or "to pound", from the era when the southern Italian coastal areas where part of Magna Graecia ("Great Greece"), starting around the 8th century BC. Almonds were crushed, ground up into almond paste. There are basically two types of almonds: sweet and bitter. The Italian masculine adjective for "bitter" is "amaro". "Amaretto" refers to a "bitter thing", plural "amaretti", and plural diminutive "amarettini". So, amaretti are special cookies that are primarily made of ground, pressed almonds. Almonds are native to western Asia, the Middle East and most of the Mediterranean, but these days the US state of California is probably the largest producer. Most of the old recipes consist of sweet and bitter almonds (the ratio appears to vary from 2:1 to 10:1), egg whites, and sugar - but no flour! This includes the two recipes (nr. 625 and 626, I believe) in the very famous and fabulous late-1900s collection of recipes from all over Italy by Pellegrino Artusi: "La scienza in cucina e l'arte di mangiar bene" - "The science of cookery and the art of eating well". There is a lot of romantic nonsense and culinary legends about the origin of these cookies. Practically every town and region in Italian claims to be "original" - so, by definition, they are all wrong. In the end, this old Italian delicacy may well be over a 1000 years old, with its real origins in the Middle East (though probably with honey instead of beet or cane sugar). Anyway, there are two main versions of amaretti. On one end of the spectrum, the ones I love: large, slightly crisp on the outside, but moist, dense, chewy, and grainy on the inside. Example: di Sassello brand. On the other end of the spectrum, the ones that I don't know what they are good for, other than for dunking in desert wine: they are small, crunchy, bone-dry, hollow, like hard foam. Example: the di Saronno brand. And some of these, such as Lazzaroni's Amaretti Originale use (bitter) apricot kernels instead of almonds. By the way, if you are going to make amaretti yourself: one key to consistency and success is weighing your egg whites! And don't worry, the cyanide in bitter almonds (or in the substitute apricot kernels) is neutralized during cooking and baking. Bitter almonds are often hard to find. Real almond essence is typically used to enhance the almond flavor. It should be clear by now, which type of amaretti are used in this recipe. So, what about the flan? I hate to admit it, but rather than making a real flan from scratch, I cheat! I use a standard package of vanilla "pudding" custard/flan powder. This is basically just ... corn starch (which actually keeps it light). Best when made 1 day ahead. A standard package contains about 40 grams of powder, and makes a little over 1/2 liter (1/2 quart) of flan/custard. In Germany, packages of "Dr Oetker" brand vanilla "pudding" are sold everywhere. The equivalent in the US and UK is, e.g., "Bird's Custard Powder"
50 grams sugar (or whatever the package says) - I actually use 10% less than what the package says. 16 large amaretti (NL: bitterkoekjes) , see photo below. They are about 3-4 cm (1.5 inch) in diameter. 1 glass tray (24x24x4 cm; 10x10x1½ inch). 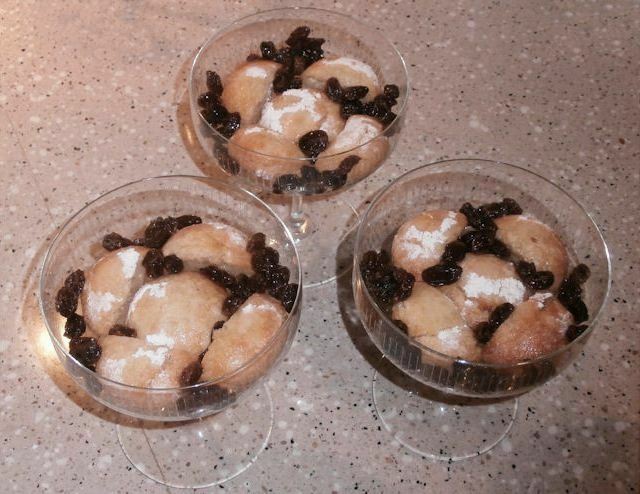 Do not use a larger tray, as the amaretti must be well-covered with flan/custard! 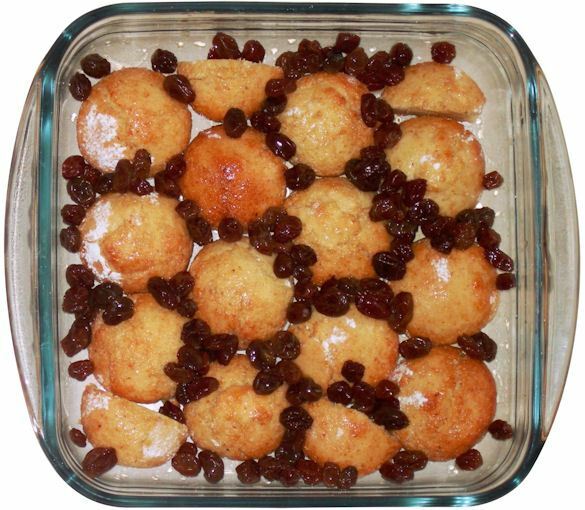 Soak the raisins in the rum for at least 1 hour. Cover the bottom of the tray with amaretti. See photo below. Drain the raisins. Do not discard the rum - it's the cook's dram! Generously cover the open areas between the amaretti with raisins. See photo below. Typically: mix the powder with several tablespoons of milk, bring the rest of the milk + sugar to a boil, add the dissolved powder and quickly mix, then simmer for 1 minute. Pour the hot vanilla pudding over the amaretti. Shake the tray a bit, to evenly spread the hot mass and get it in between the amaretti. Let cool completely before putting them in the fridge (or at a cool place). Remove from the refrigerator about 30 minutes before serving.